The European currency (euro) is used in 18 countries of the European Union forming the Eurozone: Austria, Belgium, Finland, France, Germany, Ireland, Italy, Luxembourg, Netherlands, Portugal and Spain (since 1 January 1999); Greece (since 1 January 2001), although coins and notes were released only on 1 January 2002 for all these countries; Slovenia (since 1 January 2007); Cyprus and Malta (since 1 January 2008); Slovakia (since 1 January 2009); Estonia (since 1 January 2011); Latvia (since 1 January 2014); and Lithuania (since 1 January 2015). In spite of not being members of European Union, Andorra, the Holy See, Monaco and San Marino have adopted the euro as their currency, following a monetary agreement with the European Union. Kosovo and Monteneogro have also, unilateraly, adopted the euro as their currency. The debate on a flag for the Council of Europe begins in 1949 as soon as the Organisation comes into being. Jacques-Camille Paris, the first SG, asks the Bureau of the Assembly to examine the question of a flag in September 1949, but the Bureau decides that the question falls outside of its competence. The Secretariat receives a number of proposals from the public, many of which are still preserved in the Council of Europe Archives. Paul Lévy, Director of information, calls on local heraldic experts for assistance. The following year the Assembly's Committee on General Affairs calls for a series of measures - including a flag - to raise public awareness of "European union". The Assembly refers the question to its Committee on Rules and Procedures and Privileges. This committee draws up a shortlist of 12 proposals, suggesting that it should be put to a vote of the members of the Assembly. Arsene Heitz, a Council of Europe employee working in the Mail Office, who is credited with the design that is eventually adopted, begins submitting designs for the flag in 1951 and continues to submit new designs up until until 1955. His first preference is for a flag based on the standard of Charlemagne. Almost 30 designs signed by Heitz are conserved in the Archives. Coudenhove Kalergi takes a keen interest in the events, first of all hoping that his own flag will be adopted. The Assembly organises the referendum in December 1951. Meanwhile Salvador de Madariaga (1886-1978) submits his own design of stars on a blue background "The European nations that were fully sovereign in 1938 will be represented each by a golden star on the spot occupied by its capital city on the map". The referendum produces a clear result in favour of the Kalergi proposal. This evokes a strong protest from the Turkish delegation, stating that a cross would not be acceptable to them. There follows a long diplomatic pause in the search for a flag as the Secretariat reflects on how to respond to these events. Then the idea of a flag consisting of stars moves to the fore. Proposals based on stars, partly inspired by the USA flag, had already appeared among the 12 shortlisted for the Assembly referendum. The question is sent back to the Committee on Rules and Procedures and Privileges. The Committee nominates Bichet as rapporteur. In September 1953 Bichet produces a report proposing a white flag of 15 green stars. The Committee rejects this, preferring gold stars on a blue background, but retaining the 15 stars. The plenary Assembly then adopts this flag as its own emblem (25/9/53) and recommends that the Committee of Ministers follow suit. This provokes a strong protest from Germany, since the number of stars is linked to the number of member States, which clearly includes the disputed territory of the Sarre. The Germans argue that the Committee of Ministers are the only authority competent for choosing an emblem for the Organisation as a whole. The Ministers' Deputies refer the question to the Joint Committee (15/5/54) and ask the Assembly to suspend their use of the flag. The Joint Committee concludes (19/5/54) that their must be a single emblem for the Organisation and that the Assembly must be associated with the choice, although the actual work will be overseen by the Committee of Ministers. The Ministers Deputies then set up an ad hoc expert committee of three members of the Assembly (including Bichet) and three heraldic experts to study the question. This committee produces a proposal (the "Bichet proposal") for a flag of eight interlocking rings, similar to the flag of the Olympic Games. This proposal is rejected by the Deputies (the Italians compared it to a telephone, the Germans to chains) in December 1954. In January 1955 the Secretariat mounts a mini-exhibition for the Deputies of new flag designs. From this two designs are short-listed, a Heitz design of 12 stars and the Madariaga design. The Deputies forward the two proposals to the Joint Committee, indicating their preference for the former. In October 1955, the Assembly supports the 12 star flag (25/10/55) and recommends that the Ministers Deputies adopt it. The Deputies adopt it in December (9/12/55). In 1986 the Deputies "take note with satisfaction" of the Decision of the European Community to use the flag as well as the European Anthem. It was the European Parliament which took the initiative for a flag to be adopted for the European Community. In 1979 a draft resolution was presented, shortly after the first European elections held by universal suffrage. In a resolution adopted in April 1983 the Parliament decreed that the Community's flag should be that adopted by the Council of Europe in 1955. The European Council, meeting at Fontainebleau (France) in June 1984, stressed the importance of promoting the European image and identity in the eyes of its citizens and the world. Then, in Milan (Italy) in June 1985, it gave its approval to the proposal of the Committee on a People's Europe (Adonnino Committee) that a flag should be adopted by the Community. The Council of Europe agreed to the use by the Community of the European flag that it had adopted in 1955 and Community institutions have been using it since the beginning of 1986. Thus the European flag and emblem represent both the Council of Europe and the European Community (and the European Union, since the entry into force of the Maastricht Treaty). It has now become the symbol par excellence of united Europe and European identity. The Council of Europe and the institutions of the European Union have expressed satisfaction with the growing awareness of the European flag and emblem among European citizens. The European Commission and the Council of Europe are responsible for ensuring that all uses of this symbol respect the dignity of the European flag and emblem, and for taking whatever measures are necessary to prevent misuse. The adoption process of the European Union flag is described in a paper published on 18 May 1999 in the French newspaper L'Alsace. The paper reports research done in the elementary school Aristide Briand, under the guidance of the school teacher René Hurstel. The school is located in Benfeld, in Lower-Alsace between Strasbourg and Sélestat. The twelve yellow stars on a blue field were officially adopted as the symbol of the European Community on 26 May 1986. Adoption of a flag and an anthem was suggested during the European council held in Milan on 28 and 29 June 1985. In the beginning of 1986, the European Commission believed that adoption date of the flag and the anthem should be 9 May, the anniversary of Robert Schuman's declaration of 9 May 1950, which is considered as the founding act of the European Union. a blue flag with a circle of twelve yellow stars and the letter E in the middle of the circle. the current flag (without the E), already adopted by the Council of Europe in 1955. During parliamentary sessions in Strasbourg, the Presidents of the Parliament, Commission, and Council of Ministers of the European Community often met for lunch meetings. In March 1986, the Dutch Minister of Foreign Affairs Van den Brook met Jacques Delors (President of the Commission) and Pierre Pflimlin (President of the Parliament). Pfimlin is said to have initiated the discussion on the flag. He proposed the current flag and was supported by Delors. The number of stars on the flag of the European Union is definitively 12. In 1953, the Council of Europe had 15 members and its flag should have had one star for each member. The number of stars was not to alter if the number of members changed. However Germany objected to the number 15 because one of the members of the Council was Saarland, and 15 stars would imply "star" sovereignty for that region. France would not agree to 14 stars as that number would acknowledge the absorption of Saarland into Germany. 13 was ruled out for superstitious reasons. and 12 starry crowns of the Horsemen of the Apocalypse. The question of how many stars appear on the European Flag has arisen before. When Sweden, Finland and Austria were admitted in 1995, the number of member states increased from 12 to 15. Several cases exist where people assumed that the number of stars would also increase. A graphic with 15 stars appeared on BBC News for some days. I wrote and told them it was wrong and they reverted to the correct pattern. Despite this, the 15-star version still appeared occasionally. I eventually suggested that the incorrect graphic be destroyed so that it could not appear even by accident. They may have done so as it has not appeared since then. The other, more lasting case, has been with car stickers. There are car stickers available, oval with the blue of the European flag and the stars and the white letters "GB" in the centre. Most of them have 12 stars, but there are some with 15. I have not yet discovered which company manufactures them. On 16 April 2003, the editorial placed on the front page of La Nouvelle République was entitled Le drapeau aux 25 étoiles (The 25 star flag). The last paragraph of the editorial mentions L'Europe à 25 étoiles (The 25 star Europe). The flag of the Union shall be a circle of twelve golden stars on a blue background. The anthem of the Union shall be based on the Ode to Joy from the Ninth Symphony by Ludwig van Beethoven. The motto of the Union shall be: United in diversity. The currency of the Union shall be the euro. 9 May shall be celebrated throughout the Union as Europe day. 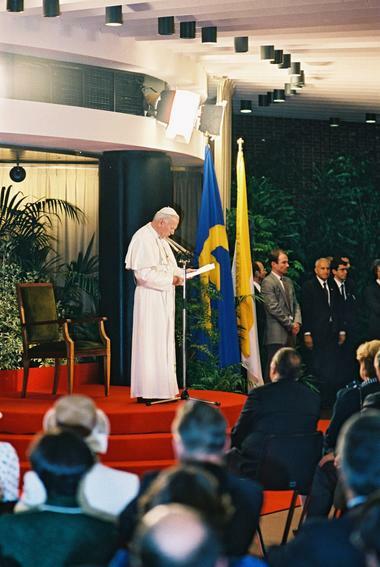 An unofficial European Community flag was displayed on the occasion of a visit to the Commission (Berlaymont, Brussels) by His Holiness Pope John Paul II, 20 May 1985 (photo). The flag is blue with a yellow symbol, probably a single round "E".